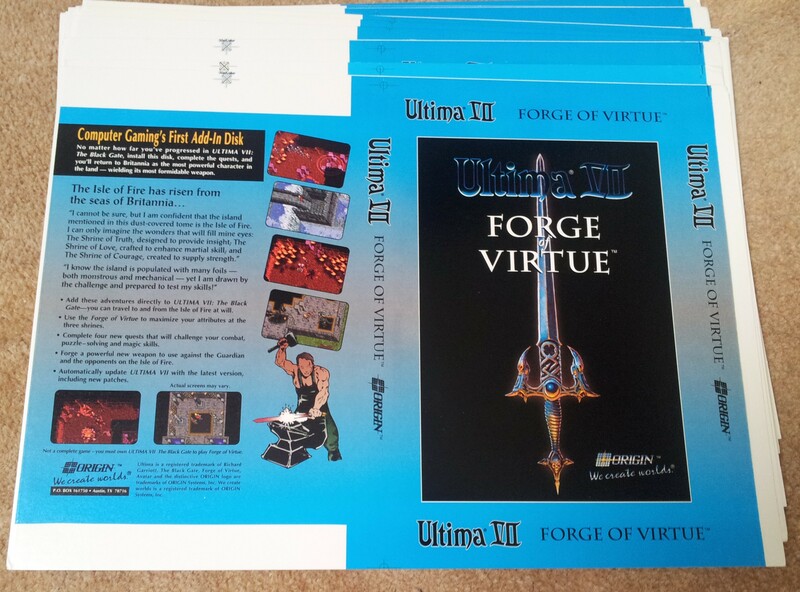 Forge Of Virtue was the self-proclaimed first gaming add-in disk when it was released in 1992, although I’m not convinced that is strictly true. It added a new island to Ultima 7, along with a handful of quests which beefed up your Avatar and provided some nice new items. As such it can be seen as something of a forerunner to the DLC we see in near enough every RPG these days. The only snag with this of course is that it wasn’t the best addition if you had already finished the game. Combined with the fairly expensive price for the amount of gameplay it offered, all the reviews I remember from the time were lukewarm but sales were clearly enough to do the same again with Serpent Isle and The Silver Seed. 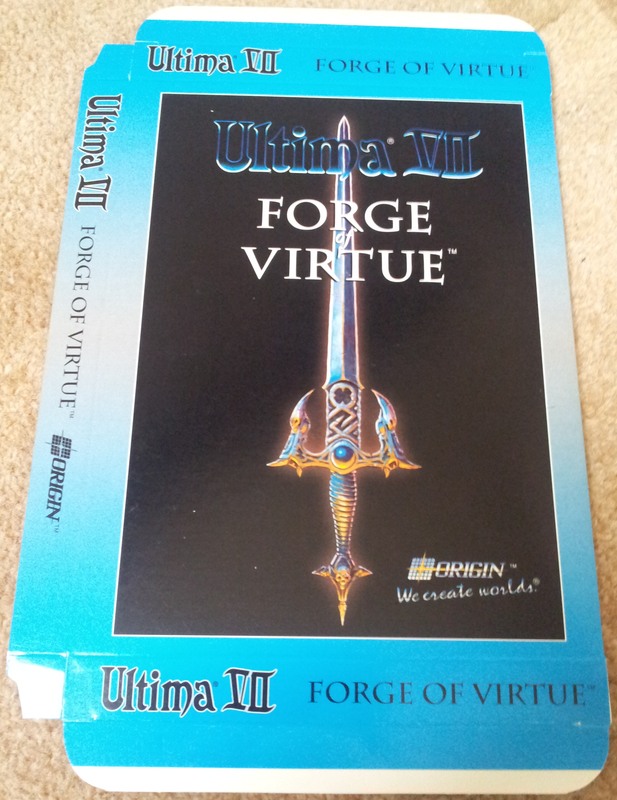 Forge of Virtue was an addon pack released sometime after Ultima 7 which added on a new island and some new quests to do. It wasn’t well received critically as I remember as it didn’t add much gameplay and if you had already finished the main game was basically pointless. I gather that there are some nice items to be had there however so on that basis I want to head straight there at this point and it should make the rest of the game easier. LB tells me that the island where I destroyed Exodus may Ultima’s ago has risen from the see (hence the earthquake). He also says that before it sunk he put three shrines to Truth, Love and Courage on the island. He gives me the deeds to his ship in Vesper + his moonstone and a crystal. The first thing to do is to head to Vesper. I try walking but just get killed off or poisened everytime. The moonstone seems to work pretty much the same as in Ultima 6 so I use that to get to the Shrine of Sacrifice and walk the rest of the way. Vesper is quite different from the rest of the towns so far being in a desert but I’m trying to keep this addon blog seperate so I ignore it and find the ship. Sailing the ship around is a bit odd as it takes up most of the screen. We really could have done with being zoomed out at this point. I bump into the right island immediately upon leaving Vesper and just have to sail around it until I find the entrance bay. On the island is a small castle with a statue for each shrine. There is also an odd mage who gives me the backstory. 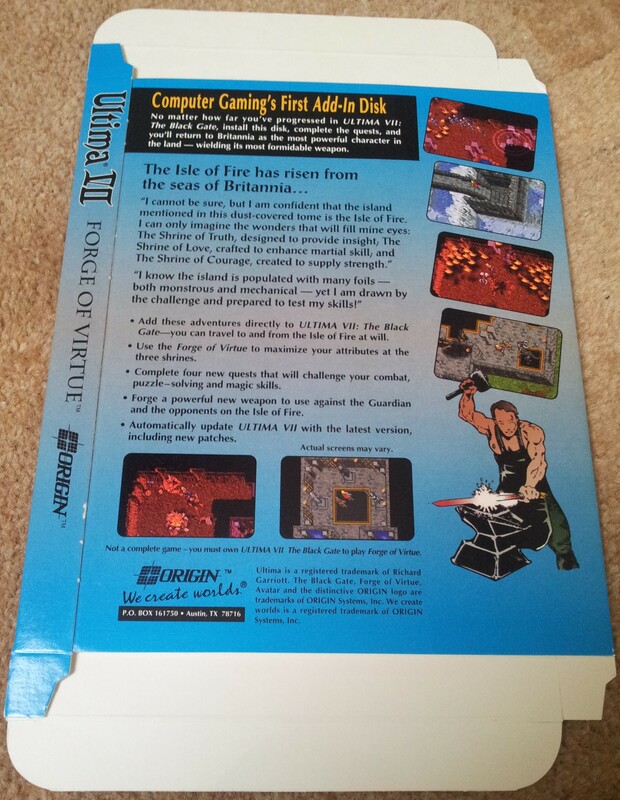 He tells me I didn’t kill off Exodus at all back in Ultima 3 but merely severed the interface between his two parts. The intellect/soul was used for the gargoyle shrine I saw in Ultima 6 but the dark core representing a store of all his knowledge is still here. The mage has been extracting information from this core and seems worried that I might try to destroy it. Talking to the statue of truth again. I get teleported to another area. After a lot of aimless walking around I discover a secret passage leading to the talisman of truth. If I’d known where this was in the first place, I could have got it in 30 seconds. The reward isn’t bad though. I get my intelligence stat maxed out to 30 after completing the quest. I try the love quest next. I meet a golem and his dead brother. He wants me to reanimate his brother and gives me some instructions. I get all the stuff I need in the immediate area and collect some blood from a “tree of life” using a bucket and a pickaxe. I then splash blood on the rocks he has already prepared, read a magic scroll but we need a heart stone as well it would seem. The golem pulls out his own heart sacrificing himself for his brother. I read the scroll to revive his brother. His brother is a lot smarter and tells me how to make a heartstone by cutting it from the tree of life using the pickaxe. I repeat the whole process and am given the amulet of love. Again when I get back my dexterity is raised to 30. On the way to the courage quest I find the dark core + a trapped demon in a mirror. The demon wants me to find a gem to release it. The courage quest is by far the hardest of the lot. Its not being helped by me being such a low level character at this point. In the first room, I walk in a a man summons a liche immediately. There are skeletons and headless all over already. I just about manage to kill them off but from this point on I have to take an evasion strategy instead. I ask my companions to wait here in the meanwhile. With a lot of saving and loading I make my way through the map. A dragon is guarding a chest containing a glass sword. I run in and retrieve this without attempting to kill the dragon. I then set it down on the floor in the little room above and the crystal ball which told me what to do in the first place changes into a key which lets me into the next section. After running around I find a dragon at the end of the map who challenges me to fight it. I’m nearly dead as it is and don’t have a chance. I search all the bodies around the place instead and the frazzled one in the middle has a glass sword. The glass sword defeats the dragon in one go but he still isn’t dead. He offers me a gem from out of his mouth. Against my better judgement I grab it. I then have to run back past all the monsters again to get back out and use the gem on the mirror. The demon is still trapped but is now in the gem instead and I can carry him with me for what its worth. I talk to the mage and he tells me about a sword he was trying to make but was not strong enough. He sets me the task of completing it for him. Its a bit time consuming but not too difficult. I just have to heat it and then beat the thing with a hammer until its sharp. I finish the sword but its too unwieldy to use. The demon volunteers to stabilise the sword but the mage doesn’t think its a good idea. A demon powered sword sounds good to me though so I bind the two together. The new blade hacks its way through monsters a lot better than anything else I’ve used to date. I use its death power on the dragon to kill it in one go. The amulet of courage is just to the north. I grab this and teleport back to the castle to receive my stat boost. This time I get another quest to find the talisman of infinity. The scroll I’m pointed towards makes little sense. The mage translates it all for me but then goes quiet when he realises I will be sending the dark core into the void. The demon sword helps me out here. First I have to go to the royal museum and fetch the two lenses I used at the end of Ultima 6. I place these either side of the core and put the talismans on the core itself. The void opens up and the core is sent to the void. The mage tries to stop me but his spell goes wrong and he is killed. I head back to report to LB and he gives me some sort of unspecified reward. This reward turns out to be another stat boost. My strength is now double the maximum possible at 60. As far as I know thats it for the addon. Its a pretty minor addition to the game, theres nothing wrong with it but it kind of feels like the money was more for the chance to up your stats than anything else. Its kind of like an official cheat pack, I now get to play the game with all my stats maxed, double the maximum strength + an impossibly powerful sword. Forge of Virtue also included a fix for the bugs that plagued the game which is as good a reason to have it as any. If you look at added gameplay, it really isn’t good value for money and has kind of removed the role playing element for me now as I can presumably slash my way through any monster the game will throw at me with ease from here on out. Its a strange idea for an addon as if anything this would appeal to the less keen Ultima players rather than the fans. I’ll get back to the main game next and explore Britain next which could take a while.